Lewis Hamilton has described Charlie Whiting as an “iconic figure” in Formula 1 following the race director’s sudden death at the age of 66. Whiting, one of the most influential people in the sport, suffered a pulmonary embolism on Thursday morning in Melbourne. He was due to officiate this weekend’s season-opening Australian GP. 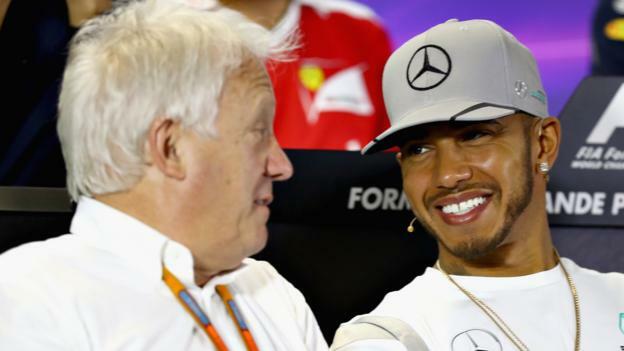 “What he did for the sport, his commitment, he really was a pillar,” five-time world champion Hamilton said. “I’ve known Charlie since I started in 2007. Obviously, I’m incredibly shocked this morning to hear the sad news. Whiting was head of Formula 1 for motorsport’s governing body the FIA, the official race starter and he oversaw all rules matters in F1. The Englishman had worked for the FIA since 1988 having initially joined as technical director. He was previously chief mechanic and then chief engineer of former F1 boss Bernie Ecclestone’s Brabham team, which won world championships in 1981 and 1983. Whiting began his F1 career with the Hesketh team in 1977, moving to Brabham for 1978 and staying there until he joined the FIA, where he had been a central part of the organisation’s running of F1 ever since. Four-time world champion Sebastian Vettel said he had spoken to Whiting at the track on Wednesday and described him as “the drivers’ man”. “I walked the track for the first couple of corners with him,” Vettel said. “It is difficult to grasp when someone is just not there any more. British driver Jenson Button, who won the world championship in 2009, said “we’ve lost such a lovely kind human being today who will be sadly missed”. “He always had the drivers safety and concerns in hand and didn’t worry about putting us in our place when we acted out of line,” he added. Former BBC F1 presenter Jake Humphrey posted a tribute to Whiting on Twitter, describing the time he first met him at the 2009 Australian Grand Prix. “You will see many, many stories on here today of what a lovely, kind, warm man he was,” Humphrey said. “Exactly 10 years ago today, it was the Thursday of the 2009 Oz Grand Prix. I was a very nervous guy, who, weeks before had been a CBBC presenter. Suddenly, there I was in Australia, thousands of miles from home, and about to present a bloody Grand Prix! “On the Thursday, the paddock comes alive, and my producer Mark told me I needed to head to the paddock and introduce myself to the teams. Now, I was relatively confident, but trust me when I tell you the paddock on your first visit is daunting. Drivers, team bosses, media, press officers, mechanics, celebs… all rushing about, seemingly knowing exactly what they are up to. Cameras flashing everywhere, clandestine meetings, deals being struck… and I had to walk into that melee and say ‘hi, I’m Jake, the new BBC guy’. Na, not happening!!! “Instead I just loitered a few feet inside the electronic entry barriers… scared to take my first few steps into the sport. “Moments later, a voice from my right… ‘I guess I should say hello’. It was Charlie. Huge smile, silver hair, warm handshake. Amazingly he had recognised me… perhaps he watched Bamzooki. “Anyway, I then introduced myself and told him I had been sent over by my producer, Mark Wilkin, to introduce myself to the paddock. “He could tell immediately I was daunted. ‘Look’, he said, ‘this place is known as the piranha club. It’s massively competitive… but it’s also a family. Also, we are now together, basically until November, so you may as well go and crack on. Any issues, just ask for Charlie’. “And that was the start of four of the greatest years of my life. A remarkable journey for me personally began with a little push from him. “I didn’t see him for a couple of races, and when I did I was sitting in the paddock in Barcelona, having a drink… he just walked passed and said ‘see, we don’t bite’. “What a guy. I’m so sorry for his family and friends to be typing a tribute to him, just days before he was due to be doing what he did best, running an F1 race.